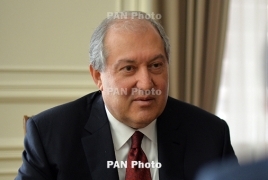 PanARMENIAN.Net - Armenian President Armen Sarkissian will leave for Germany to participate in the opening ceremony of the Munich Security Conference. Sarkissian is also scheduled to visit Germany's oldest university in Heidelberg where he will deliver remarks and engage in a Q&A session with those attending the event. According to the president’s office, he will also stop by the European Southern Observatory.